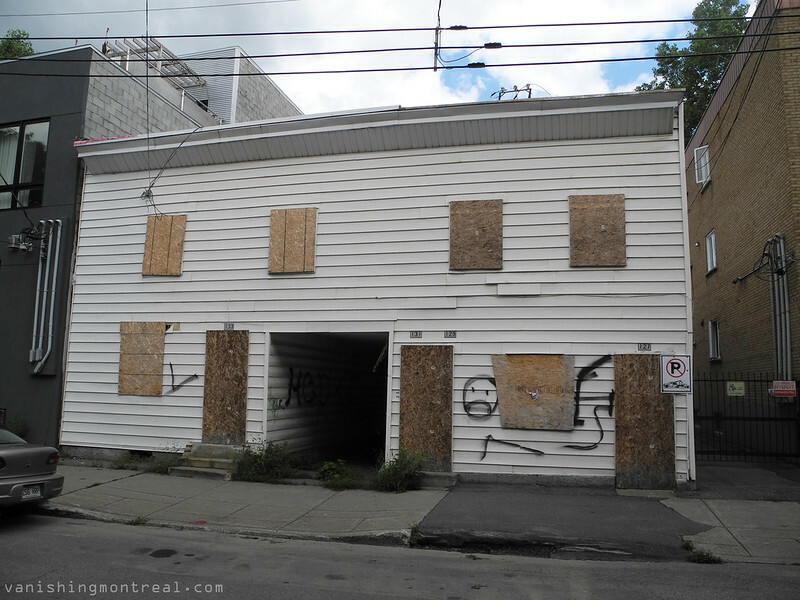 Abandoned and boarded up fourplex in St-Henri. This place has been abandoned for a long time, as far back as 2010 and yet the plywood were installed just during the last year and half or so. Abandonné et barricadé quadruplex à St-Henri. Cet endroit a été abandonné pendant une longue période, d'aussi loin que 2010 et le plywood a été installé seulement tout au cours de la dernière année et demie. Off street parking (you don't even have to drive fully through the passage so that makes things easy) and a decent backyard (otherwise there wouldn't be a passage at all) - this would be a very nice place to pick up and work on for someone. Like me. If, you know, I still lived in Montreal and had the patience and bank account. I'd just love for someone to take this project on, do a sympathetic renovation and make this gem shine. And for the love of Elvis, *not* that ugly 'urban concrete block' stuff like we see on the left. I wonder if there's any interesting brick work under all that wood?